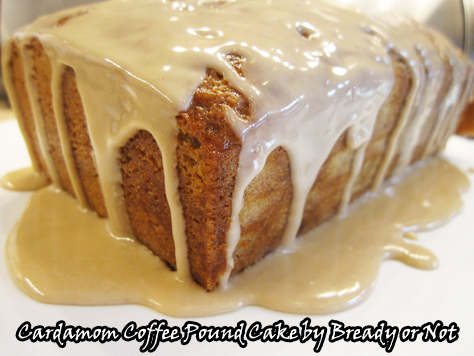 Eat your morning coffee in this luscious Cardamom Coffee Pound Cake! Weird fact: I actually considered skipping the glaze on this because I figured it would be a delicious cake on its own. What was I thinking? The glaze makes this cake. My husband’s workplace lives on coffee. He brought this loaf cake and it was consumed almost instantly. Apparently, the loaf was practically divine when paired with a hot cup of coffee. This recipe has coffee going on all over the place, too. Espresso powder is in the cake batter. 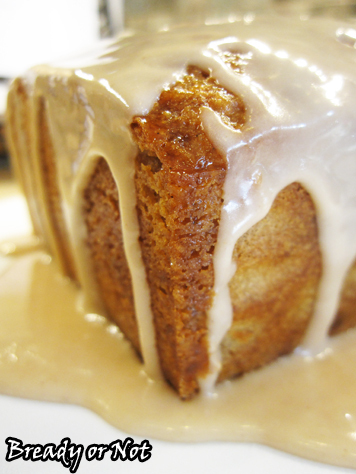 Brewed coffee is infused in the baked cake, and is also the primary liquid in the glaze. Plus, it uses one of my favorite spices: cardamom. Which happens to be perfect along with coffee. Coffee and cardamom embody this loaf cake with spicy magic. This isn’t merely a “coffee cake,” as in a cake to eat with coffee–it has coffee laced into every layer. Start your morning off with a caffeine-sugar wallop! Modified from Relish Magazine. Preheat oven to 350-degrees. Cut a piece of parchment paper to act as a sling across the wide part of a 8 1/2 by 4 1/4-inch loaf pan. Grease the pan well, press in the parchment paper inside so it sticks up on either end, and grease the paper as well. In a medium bowl, combine flour, baking powder, salt and 1 teaspoon cardamom. Set aside. In a large bowl, combine yogurt/sour cream, 1 cup sugar, eggs, vanilla extract, hydrated espresso powder, and oil; whisk well. 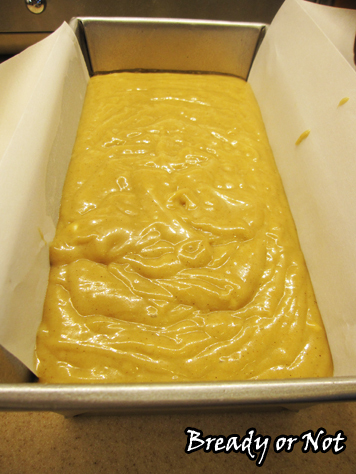 Pour batter into prepared pan and bake 50 to 55 minutes, until it passes the toothpick test in the middle of the loaf. Let it cool in pan for 10 minutes then lift out by the parchment and place on a wire rack over a sheet pan. You can reuse the parchment by placing it beneath the rack to make the next clean up stage easier, too. While the loaf is still warm, use a chopstick or skewer to poke deep holes all over the top and sides. Use a saucepan to heat up the 1/4 cup brewed coffee and 1/4 cup sugar until the sugar is dissolved. Slowly spoon the coffee mix over the cake, giving the liquid time to soak in; use it all, with the excess dripping into the pan below. 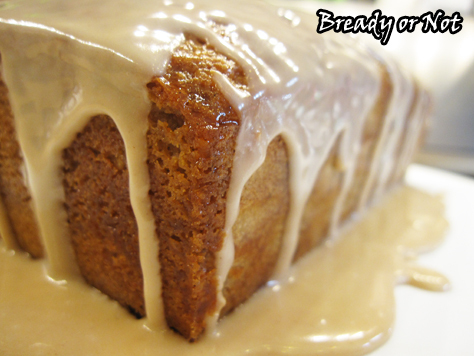 When the loaf cake is completely cool, make the icing. Combine sifted powdered sugar, remaining 2 tablespoons brewed coffee, and pinch of cardamom. Stir until smooth. Add more sugar or a touch of coffee (or milk or water, in a pinch) if needed for consistency. Drizzle glaze over cake. This is a great recipe! I decided I wanted to make a cardamom coffee cake and looked around online to see if anyone had done this before, and this is one of two recipes I found that looked good. The other one called for ricotta cheese but had some other aspects I didn’t like. So I tried yours. My substitutions: melted butter instead of oil, and half sour cream, half ricotta cheese for the yogurt/sour cream addition. 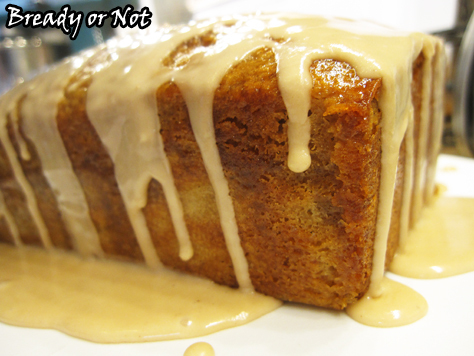 It comes out great, the coffee infusion and glaze make it so flavorful and moist. I just started selling this to a local arthouse theatre that features some of my other goodies, and it is selling really well! Thank you! I look forward to trying some of your other recipes. Wow, your new version sounds fantastic! I can just imagine how the ricotta cheese would alter the taste and texture in wonderful ways. Thank you for letting me know! I hope you enjoy my other recipes, too.